Nothing like Coney Island on a frigid winter’s day with a visit to Nathan’s (yum) and Brooklyn’s NY Aquarium. The Aquarium is still undergoing construction from the devastation of Hurricane Sandy and the promises of new and exciting exhibits will be happening soon(ish). 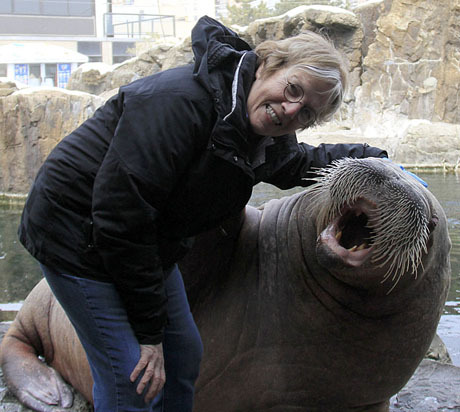 A huge shout out to Kayla, Martha, the keeper staff and the amazing Nuka the walrus for making us feel so very welcome. We will be back. Great photos. Everyone here looks pretty happily recovered from Sandy, thanks toa lot of hard work, I’m sure. Is Nuka the one who was the baby at the time of Sandy who seemed to be having a grand ol’ time swimming around outside of his enclosure? Thanks, Gloria. The walrus baby is now living on the west coast until he can return to his rehabilitated exhibit. Nuka is a 32 year old wonder gal. My first day at work someone dropped a toy camera in Nuka’s moat. I jumped over the rail, retrieved the camera and got my first kiss from a walrus!